Manchester United boss Jose Mourinho has reportedly admitted that the Red Devils are ‘worried about their Premier League position’ after having lost 1-0 to Chelsea, but is said to be optimistic to cover up the gap during the hectic winter schedule. United dropped points at Stamford Bridge, but retained their No. 2 spot only via goal difference. On the other hand, league leaders Manchester City thumped Arsenal 3-1 to cement the top spot, and have now gone eight points clear of the Red Devils. However, according to Manchester Evening News, Mourinho ‘believes (that) their squad strength could help them make up the deficit during the busy winter period’. It was claimed that the Special One believes that his sizable squad would come in handy once the burden of fixtures intensifies. The Portuguese tactician currently has a 27-man first-team squad, while the Cityzens’ boss, Pep Guardiola, has just 24 men at his disposal. 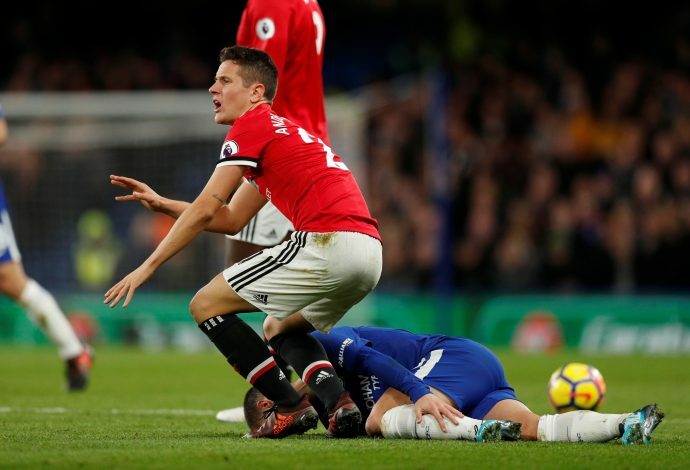 Also, with Marouane Fellaini getting some minutes under his belt following an injury in United’s loss to Chelsea, and Marcos Rojo also travelling with the team to London, the Old Trafford giants could soon find themselves back to full force. It was further reported by MEN that the United gaffer ‘has a feeling (that) Zlatan Ibrahimovic will play again this year’, and Paul Pogba, who returned to Carrington last week after a hamstring injury, is also very close to making a return for the club. “We are worried, but there are 18 teams more worried,” Mourinho said. “Because we are second, so eight points in the Premier League is not the same as eight points in the Portuguese league, La Liga or the Bundesliga. Eight points in the Premier League, there is still a lot to play and I hope, I feel, I wish I wish that in the busy period of late November, December, beginning of January.